Penneagle Putters were developed for a single purpose to consistently Sink Putts! Our solutions to missed putts include our Penneagle Mallet and Blade putters with the Oppositional Weighting System (OWS) and Penneagle Alignment Guides (PAG). The Penneagle putters with their traditional look and Oppositional Weighting System (OWS) help improve stability and consistency in putting. 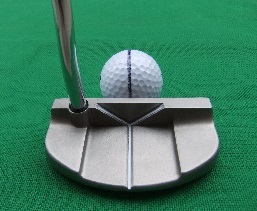 The Alignment Guides (I-Ball, V-Channel) aid in Ball Alignment and V-Site Squares the Putter Face to your intended Target line at Set Up and Impact. Feel the Balance and note the improved Accuracy. Our patented OWS with perimeter weighting creates a higher Moment of Inertia (MOI) and expands the “sweet spot”. 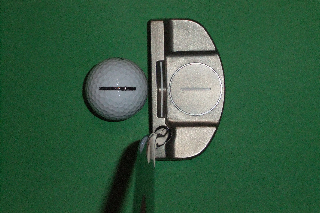 The patented PAG (I-Ball Insert) is a visual aid for improving Ball Alignment and the vertical V-Site squares the Putter Face to the Target Line. Click "PAG" for more on the Penneagle Alignment Guides.